Buckle up for the ride of a lifetime! 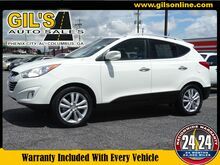 This 2012 Hyundai Tucson Limited includes a top-notch braking assist, dual climate control, hill start assist, stability control, traction control, anti-lock brakes, dual airbags, side air bag system, and airbag deactivation. This one's on the market for $14,995. This crossover is one of the safest you could buy. It earned a crash test rating of 4 out of 5 stars. Rocking a ravishing white exterior and a gray interior, this car is a sight to see from the inside out. Spoiler alert! This crossover has a rear spoiler, so you can look and feel like an all-star. Don't sit on this decision for long...schedule your test drive today!